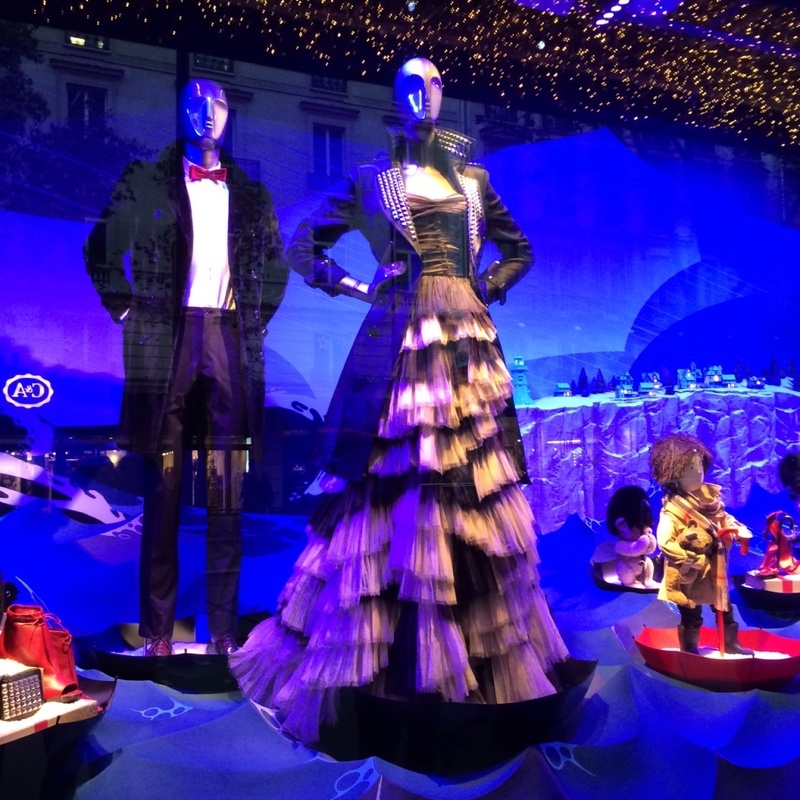 Holiday windows in Paris are less expansive than New York City, but equally entertaining. 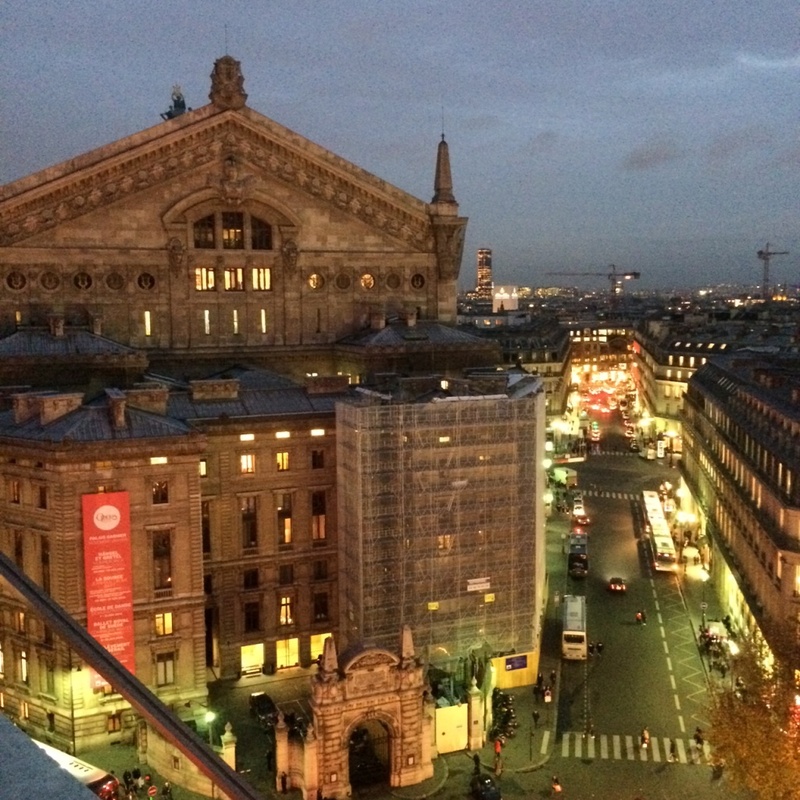 Permit me to guide you through the color and festivities of a Parisienne Christmas holiday season. 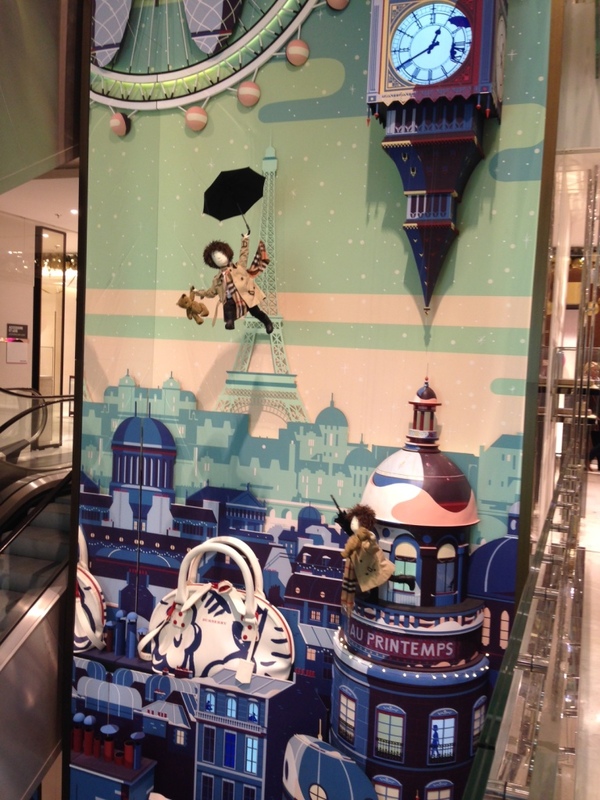 Shopping meccas, Printemps and Galeries Lafayette, go to town each year. 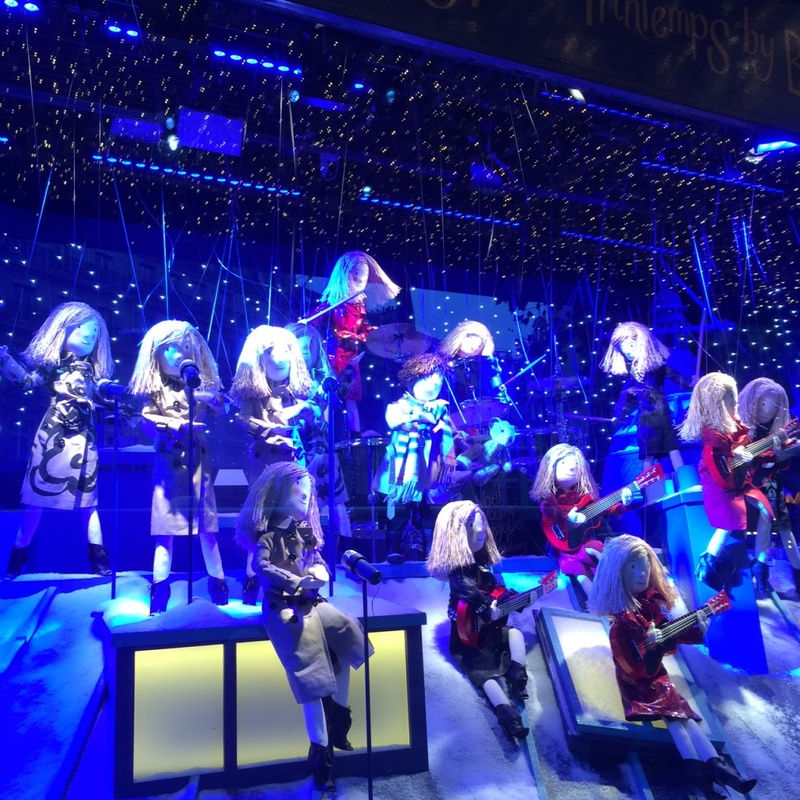 Burberry took over the Printemps windows and feature holiday inspired clothing as well as small fry stylin’ and rockin’ out in their Burberry outfits. 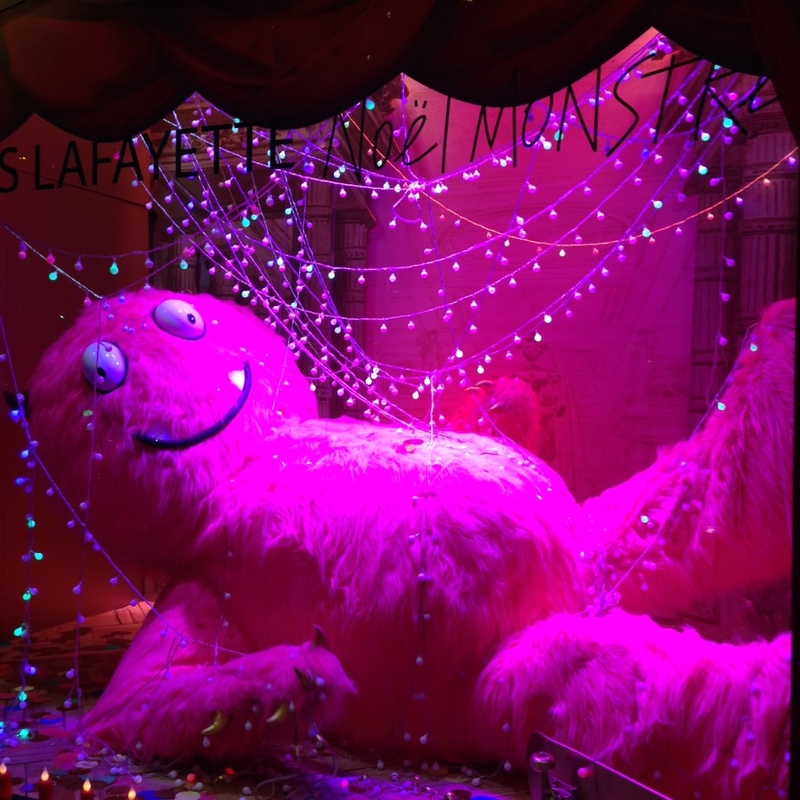 Galeries Lafayette features a gang of monsters in all sizes and shapes…the young frenchies were crazy excited taking in the windows the afternoon I strolled by. 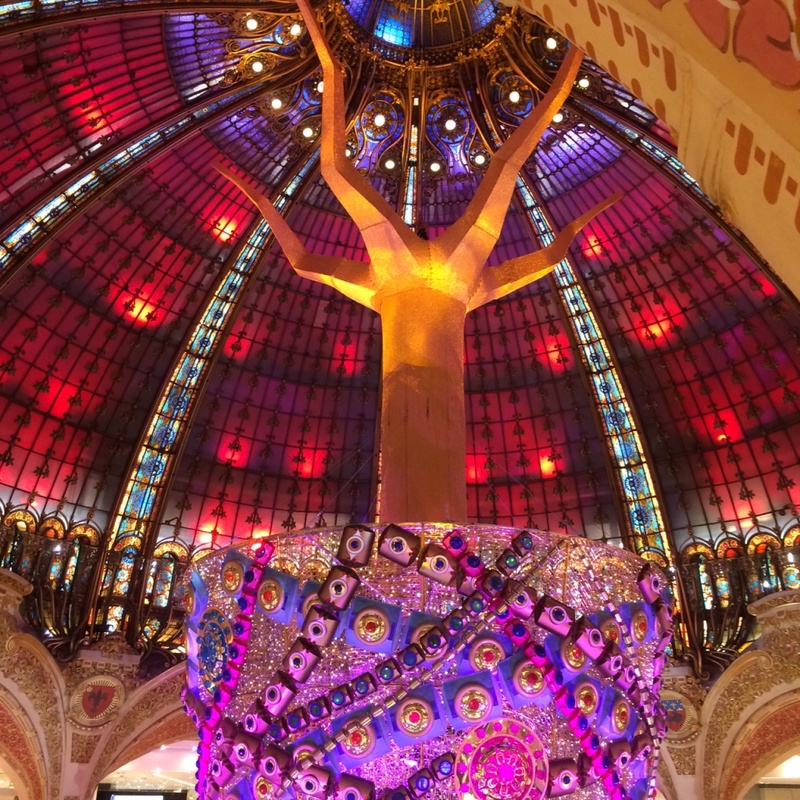 Gallerie Lafayette interior is magnificent. The rotunda is gorgeous year round. 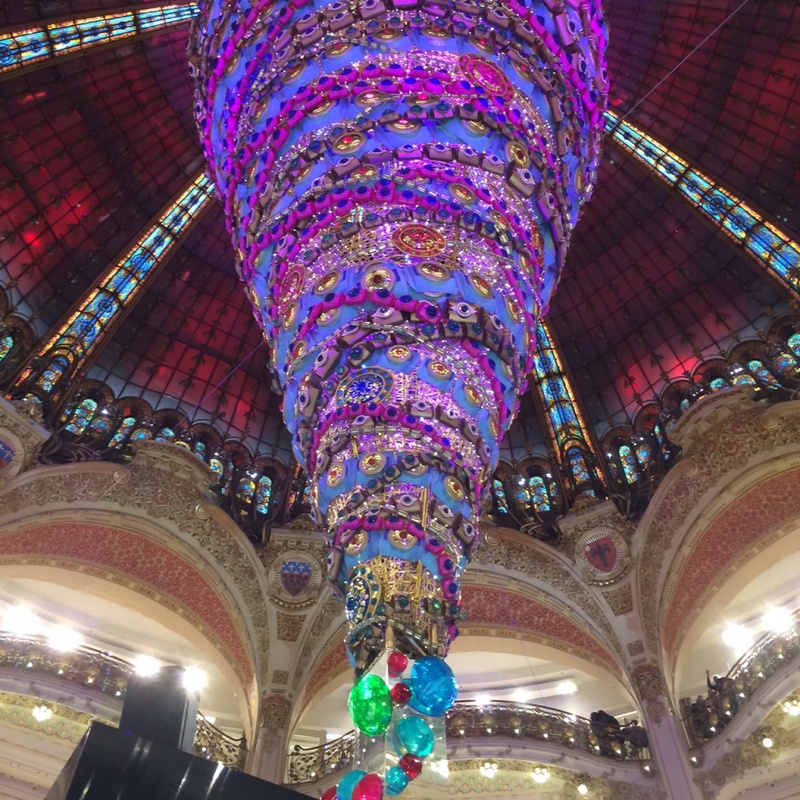 For the holidays they have a colorful sphere that reaches 7 stories high. 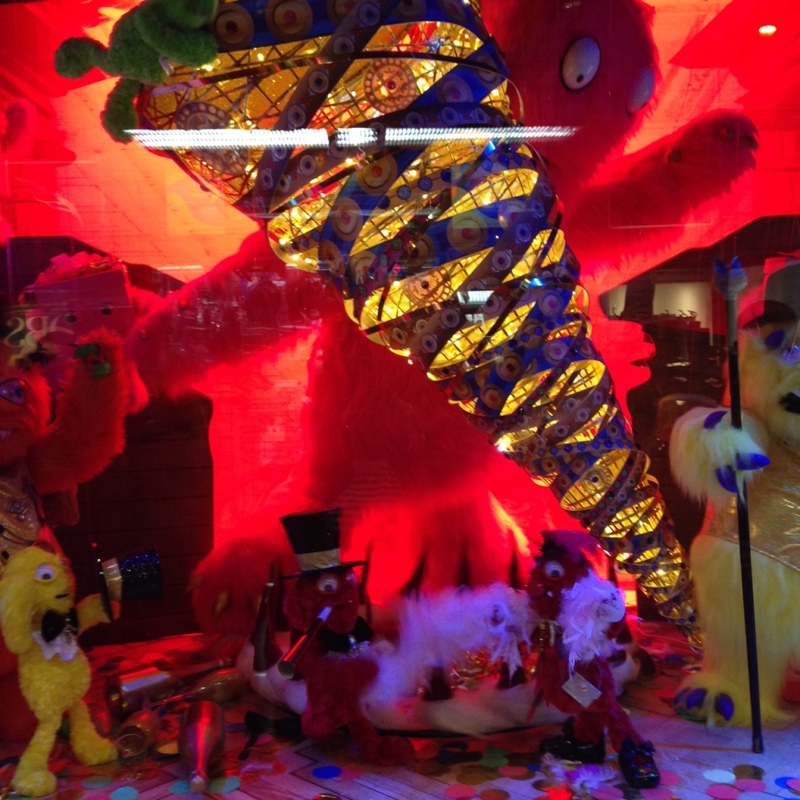 The outside windows presents a parody of the monsters taking down the conical sphere. The outdoor view, 8 stories up, is amazing and a well kept secret. When we climbed to the top, only a handful of people were outside admiring the breathtaking 360 degree view. 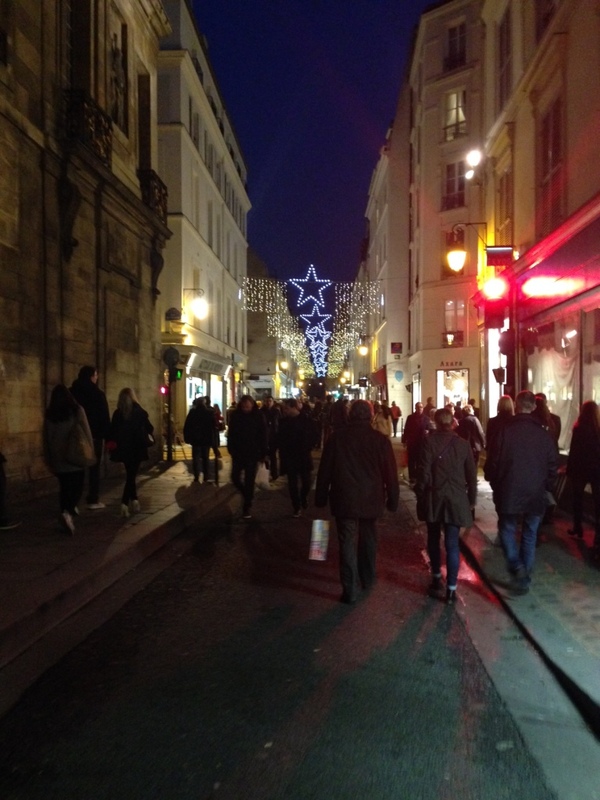 The Marais also has brilliant lights strung across the cobblestone streets. 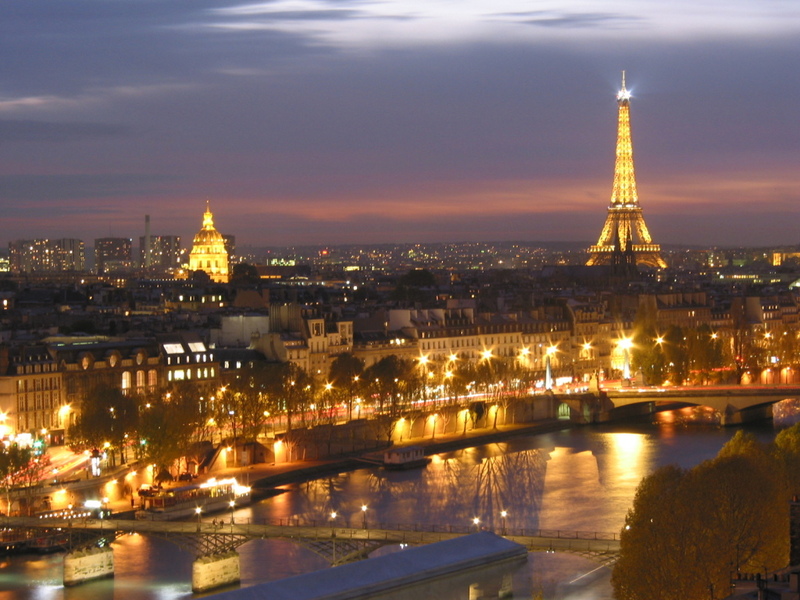 The City of Lights is mesmerizing any time of year, but the lights during the holidays electrify Paris even more. I want to wish all my readers a fabulous Thanksgiving…mine will be spent in San Sabastian, Spain at a Michelin starred restaurant…of course, review to follow. Have a devilishly fantastic holiday weekend and I will catch up with you all again next week. Au revoir, until we meet again.